Distributed from Massachusetts (USA) to Brazil, including the Carribean and Gulf of Mexico, the stock structure of this species is not clear. Spawning areas are known in the Carribean but not yet in the Campeche Bank (Eklund et al. 2000) . The artisanal fleet uses mechanized lines and handlines, while the industrial fleet uses bottom longlines. This profile refers to the Southern Gulf of Mexico Assessment Unit. There is lack of information on possible effects of the fishery on PET species but the impacts are considered low. Implementation of the management plan started in 2015 which will increase the minimum landing size, close areas, and reduce fishing effort and mortality. Closed area size has increased and data collection improved due to the FIP. This stock and associated species are expected to recovery by 2022. Historical biomass and catch data tend to feature both red and black grouper aggregated together, stymying historical trends analysis for both species individually. There are no quotas for species within this fishery. Overfishing may be occurring but poor data collection practices obscure full knowledge. Proposed management measures are not known to be in place yet. Environmental impacts are not quantified. Develop a system to report catch by species. Work with scientists to develop a formal stock assessment for black grouper. Ask INAPESCA to update the National Fisheries Chart (Carta Nacional Pesquera) with specific advice for sustainable management of black grouper including reference points, catch limits, a harvest control rule, and effort limitation. Work with managers implement the regulations specified in the 2014 multi-species grouper fishery management plan and in accordance with advice from INAPESCA. Ask managers to implement an observer program with adequate coverage to collect informative data on bycatch and fishery interactions with endangered, threatened and protected species. Press the government to enhance enforcement and control measures to ensure compliance with fishery regulations, particularly those related to seasonal and spatial closures, minimum legal sizes, and fishing effort. A formal stock assessment for black grouper in the southern Gulf of Mexico has not been conducted; it is considered near-threatened by the IUCN (IUCN 2008) . This is a large, slow growing species which is highly available to a very active fishery, rendering it at ongoing risk for overexploitation. Absence of catch data for black grouper (rather than red, or red and black combined) prevents assessment. Red grouper biomass is used as a proxy for the health of the whole stock assemblage, which is likely to decreasingly beneficial if fishers are moving from red onto black grouper, and especially since data have not been collected since 2009 (Diario Oficial de la Federacion (DOF) 2014) . The National Fisheries Institute (Instituto Nacional de Pesca, INAPESCA) belongs to the Secretary of Agriculture, Livestock, Rural Development, Fisheries and Food (Secretaría de Agricultura, Ganadería, Desarrollo Rural, Pesca y Alimentación, SAGARPA) and coordinates and conducts scientific and technological research on fisheries and aquaculture resources and provides the advice for CONAPESCA. Since 2000 INAPESCA creates the National Fisheries Chart (Carta Nacional Pesquera, CNP) which should be updated yearly and is developed under the Fisheries Law. The CNP constitutes a state of the art review of Mexican fisheries (by species or group of species) and defines guidelines, strategies and measures for conservation, protection and management of the fishing resources. No formal scientific advice for a catch limit is known to exist for the grouper fishery, only recommendations based on the status of the stock. This is based on red grouper rather than black grouper (Diario Oficial de la Federacion (DOF) 2014) . Annual quotas and onboard observers are proposed by the scientific programme, initially to the industrial fleet (SAGARPA-CONAPESCA 2016) . These were first proposed in 2006. The red and black grouper management plan (Diario Oficial de la Federacion (DOF) 2014) follows scientific advice (Monroy et al. 2010) (SAGARPA 2012) to expand the closed season, increase the minimum landing size, and reduce the fishing effort and mortality level, as well as expand scientific research into the species. The management plan will be revised after 3 years of implementation. There are no reference points defined for this stock. Catches of target species of the multi-species fishery, including all fleets operating, are composed of 47% Black grouper Mycteroperca bonaci, 44.1% of Red grouper Ephinephelus morio, 3.1% of Mutton snapper Lutjanus analis. In the artisanal sector, Red grouper is 56.7% of the catch but proportions depends on the fishing area and season (SAGARPA-INAPESCA 2014) . Total landings in 2010 were of 7500t, 2500t for the artisanal sector and 5000t for the industrial component and biomass has been around 50,000t (SAGARPA 2012) . Biomass of the all grouper (red and black) dropped from 250,000t in 1960 to 50,000t in 1990, where they remained in 2010 (SAGARPA 2012). Landings of Black and Red grouper have been steadily declining from a high in 1972 (SAGARPA-CONAPESCA 2014) , with numbers relatively stable (decreasing much more slowly) since 1995 (SAGARPA 2012) , however falling numbers of red grouper have seen some fishery effort move towards prosecuting black grouper (SAGARPA-INAPESCA 2014) . Both artesanal and industrial landings have gradually decreased between 1990 and 2010, ending with totals of 2500t and 5000t respectively, for a grand total of 7500t in 2010 (SAGARPA-INAPESCA 2014) . The National Commission of Aquaculture and Fisheries (Comissión Nacional de Acuacultura y Pesca, CONAPESCA) belongs to SAGARPA and is the regulatory agency, in charge of management, coordination and policy development of marine resources (FAO, 2005). There are no quotas for species within this fishery. A management plan for the red grouper fisheries and associated species, including the black grouper, in the Yucatán peninsula was published in November 2014 and its implementation started in 2015 (Diario Oficial de la Federacion (DOF) 2014) . The development and publication of this Management Plan was undertaken by INAPESCA while the implementation will be done by CONAPESCA, according with the laws and regulations in place. The main goals are: increase the closed season to protect the biomass of the red group and associated species, increase the minimum landing size to protect the juveniles, definition of closed areas to the fishery and reduce the fishing mortality level. The industrial effort should be capped to 320 active vessels, a moderate reduction; the artesanal fleet is not scheduled to have its effort capped despite contributing significantly to total catches. This stock and associated species are expected to recovery by 2022. The management plan will be revised after 3 years of implementation (SAGARPA-INAPESCA 2014) . From 2003 to 2005, a seasonal fishing closure was set because of the poor status of red grouper stock (below the limit and target biological reference points) and to protect the reproduction period and area in the Yucatán peninsula (including Campeche, Yucatán and Quintana Roo Mexican water states) for grouper stocks. This prohibits the use of bottom hooks and lines in a defined area and is ongoing (2017) (SAGARPA-CONAPESCA 2016). Fishing is also not allowed in specific areas defined for protected species (SAGARPA 2012) (SAGARPA-CONAPESCA 2016) . In 2007, the Mexican Official Standard NOM-065-PESC-2007 set several management measures for the grouper fishery particularly for the artisanal sector of the fleet: gillnets and spearfishing (fisgas) are not allowed; minimum landing size at 30.9cm from 2007 to May 2010 and at 36.3cm since that date (SAGARPA 2012) (Diario Oficial de la Federación, DOF) (SAGARPA-CONAPESCA 2016) . Gear limits regarding the number of hooks and lines and mandating the installation of VMS were also introduced (Diario Oficial de la Federacion (DOF) 2014) . The FIP is delivering results already with increased size of area closures and better data collection (CeDePesca 2017) . A management plan for the red grouper fishery and associated species in the Yucatán peninsula was develop in 2014. This stock and associated species are expected to recovery by 2022 (SAGARPA-CONAPESCA 2014) - however the success of these plans will depend on how strictly they are enforced, and whether they are regularly updated to adapt to the changing situation. Traditionally, three fleets have been active; Mexican industrial (about 515 vessels) and artisanal vessels (about 1,850 vessels) and a small fishery specific Cuban industrial fleet. However, the last one seems to be no longer active (Scott 2014) . The artisanal fishery represents about 55% of the total catch (Diario Oficial de la Federacion (DOF) 2014) and they are known to catch immature fish (40% below MLS, most are immature) (Coronado and Salas 2011) , a serious concern for management efforts. As a generality, IUU fishing may add 30% to recorded catches of all species across Mexico between 2002 and 2012 (Centro de Colaboración Cívica 2013) . Illegal fishing is detected in Natural Park Arrecife Alacranes as well as in National Park Arrecifes de Cozumel. Control measures are considered insufficient and inefficient and also in Reserve of Biosphere Arrecifes de Sian Ka’an. Goals and actions for fisheries comprised in the management plan of National Park Arrecifes de Cozumel have not yet been accomplished (SAGARPA 2012) . Vessel Monitoring Systems (VMS) have been installed on the industrial vessels since 2010. However, for example in Yucatan, the number of inspectors is very small (only 8) to enforce regulations in ~4,200 artesanal vessels (Scott 2014) . Nonetheless, frequency of enforcement events has steadily increased in line with increasingly numerous inspections (SAGARPA-CONAPESCA 2016) . Hawksbill Turtle Eretmochelys imbricate (Critically endangered; (Mortimer and Donnelly 2008) ) and loggerhead turtle Caretta caretta are the main marine species within Biosphere Reserve “Ría Celestún” that can interact with the fishery. Green turtle Chelonia mydas (Endangered), leatherback Dermochelys coriacea (Vulnerable) and hawksbill turtle nest in all islands of the Marine National Park Arrecife Alacranes. Reports of interactions with the fishery are lacking but spatial overlap with the longline fishery would be expected to result in bycatch as it does in the USA. Common bottlenose dolphin Tursiops truncatus (Least concern) is also distributed in Gulf of Mexico and there is no data for Tamaulipas. There are recorded interactions (death and permanent injuries) with fishing vessels operating, in general (SAGARPA 2012) but no reports of bycatch (or any mention at all) in recent reports (SAGARPA-CONAPESCA 2016) . Specific studies about the interaction of the fishery with Protected, Endangered and Threatened (PET) species are required (SAGARPA 2012) . Tropical coral reefs in the Gulf of Mexico and Caribbean Sea and within the fishing area are considered to be subject to a “low level” and “high level” of threat (DOF 2010) . Some of the coral species identified are in IUCN Red list: staghorn coral Acropora cervicornis (Critically Endangered), fragile saucer coral Agaricia fragilis (Data deficient); lettuce coral A. agaricites, grooved brain coral Diploria labyrinthiformis, symmetrical brain coral D. strigosa, smooth flower coral Eusmilia fastigiata, spiny flower coral Mussa angulosa, mustard hill coral Porites astreoides, finger coral P. porites, lesser starlet coral Siderastrea radians (all Least concern) and Millepora alcicornis (Least concern). Strong sanctions for damaging coral and killing turtles are in place (Scott 2014) . The artesanal fleet mainly focuses on Lane snapper Lutjanus synagris and Yellowtail snapper Ocyurus chrysurus; only 6% total catch is recorded as "other", which includes four ETP species (Lutjanus campechanus, Lopholatilus chamaeleonticeps, Lachnolaimus maximus, Rhomboplites aurorubens) (IUCN 2017) . Shark and ray species are reported in the catch but only Sphyrna lewini is considered ETP (Monroy et al. 2010) , (Coronado and Salas 2011) , constituting <1% catch volumes. Fishing mortality on ETP species is low and cumulative impacts are anticipatd to be low also, though data are lacking. Closed areas/MPAs and closed seasons in place protect ETP species as well as target species. 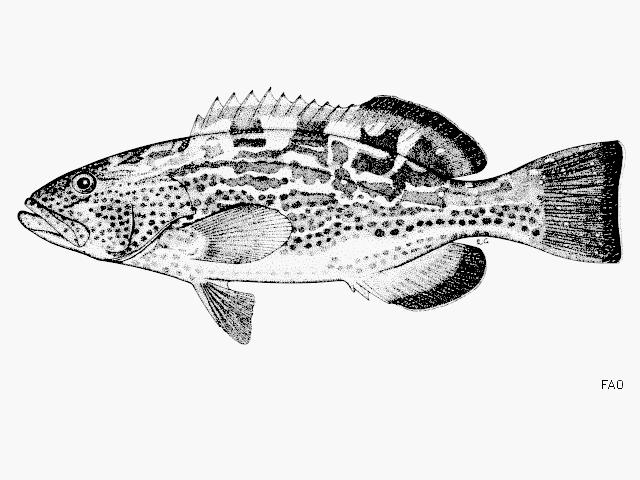 Red grouper is the main species of the multispecies fishery. Black grouper, gag and yellowfin grouper comprise the second most important group and then other species such as yellowedge grouper Epinephelus flavolimbatus, speckled hind E. drummondhayi, nassau grouper E. striatus, warsaw grouper E. nigritus are also captured, among others. Bycatch species are jolthead porgy Calamus bajonado, graysby Cephalopholis cruentata, white grunt Haemulon plumieri, mutton snapper Lutjanus analis (SAGARPA 2012) and are in different proportions depending on the fishing area (Rosas et al, 2010). In general, there are about 19 species of serranids associated with this fishery (SAGARPA-CONAPESCA 2014) . In the artisanal fishery every fish is landed and discards are negligible (Scott, 2014). Gag grouper is potentially overfished and can be confused with black grouper (SEDAR 2009) . The ecosystem has been recently modelled, relating components to the environment (Sagarese et al. 2017) . A new (2017) study demonstrates that reducing hook soak times to less than an hour will likely reduce bycatch of sharks and reef species without impacting grouper CPUE (Foster et al. 2017) . Black grouper distribute over hard bottoms including corals, and subsequently bottom set longlines could impact sensitive reef habitats. However, the gears predominantly employed in these fisheries are unlikely to cause significant widespread damage in the way that dragged mobile gears do. Further, the fishery has primarily worked the sandy bottom areas to target red grouper (SAGARPA-CONAPESCA 2014) although that may be changing if effort shifts to black grouper. Adult red grouper (the primary target of the fishery) distribute over sandy bottoms, and subsequently bottom longline fishing does not represent a notable threat to sensitive reef habitats (SAGARPA-CONAPESCA 2016) . A network of Marine Protected Areas (MPA) is established in Mexican waters. A special license is to be required to Secretariat of Environment and Natural Resources (Secretaría de Medio Ambiente y Recursos Naturales, SEMARNAT) to fish in protected areas and each one possess management programs which regulate activities within. Some MPA overlap with the fishing area (federal states of Tamaulipas, Vera Cruz, Tabasco, Campeche, Yucatán and Quintana Roo): National Park Arrecife de Alacranes, Reserve of Biosphere Arrecifes de Sian Ka’an, National Park Arrecifes de Xcalak, Reserve of Biosphere Banco Chinchorro, National Marine Park Isla Mujeres, Punta Cancún y Punta Nizuc, Laguna de Términos, Reserve of Biosphere Los Petenes, Reserve of Biosphere Ria Celestún, Reserva of Biosphere Los Tuxtlas, National Park Arrecifes de Cozumel, Arrecifes de Tuxpan. In Tamaulipas (Rancho Nuevo Beach), Yucatán (beach near Río Lagartos) and Quintana Roo (Isla Contoy Beach) there are Sanctuaries for the protection and conservation of sea turtles. Fishing activities during the nesting period in a buffer area of 4 nautical miles are object of special rules (Agreement D.O.F. el 16 de julio de 2002; (SAGARPA 2012) . In 2015, it was established a protection area in Quintana Roo for 22 species, including the red grouper (SAGARPA-CONAPESCA 2016) . The closed area has been expanded due to the ongoing FIP (CeDePesca 2017) ​. Absence of Reference Points or TAC-based management is offset by trends showing the stock has not been in peril (SAGARPA-INAPESCA 2014), and recent installation of management measures designed to ensure the stock remains healthy (DOF 2014). However, data have not been collected since 2009. Numerous scientific recommendations have ben codified into the thorough 2014 management plan (DOF 2014), however it is not know whether this is being enacted and thus improvements are being made. Compliance with closed areas and seasons is not deemed to be a sizeable problem (SAGARPA 2012); lack of quotas means overfishing technically can't be occurring but trends analysis suggests catches aren't likely to be seriously imperilling the stock at this time (SAGARPA-INAPESCA 2014), however IUU & undersizede landings are a concern (Coronado & Salas 2011) which the management plan (DOF 2014) is aiming to address. Landings and biomass trends suggest the stock is unlikely to be concerningly unhealthy (SAGARPA-INAPESCA 2014) however sparse data disallow confident assessment of the state of the stock. In general, there was a drastic reduction of the groupers biomass since 1960's until to 1990's but the values have been stable since then and several management measures have been implemented. If catch levels remain at existing levels or have risen only moderately in recent years (SAGARPA-INAPESCA 2014), and changes resulting the 2014 management plan (DOF 2014) are successful, stock health is likely to at least remain stable and probably improve. Occasional interactions with turtles and dolphins are anecdotally noted but data are not recorded; mortality is thought to be very low. Official statistics are not required to be captured, although the bulk of non-target species for the red and black grouper fishery are generally landed as they have market value, thus are not treated as bycatch in that sense. ETP bycatch species represent <10% artesanal fleet catches. The fishery interacts with turtles and dolphins and corals however the impacts are anticipated to be low, albeit of unknown magnitude (SAGARPA-CONAPESCA 2016) (DOF 2010) . There is no current indication nor intimation that bycatch species (i.e. not red or black grouper) are imperilled by the fishery, and pending management and compliance improvements should ensure that remains the case. No bycatch mitigation measures are in place nor have been explicitly proposed, but impacts are low, however general management proposals (reduction of effort, improved compliance) should reduce bycatch. The length of season and location of fishing fleet activity is well known, and the fleet primarily works sandy ground which is resilient to impacts, however some impacting of corals is known to occur. The magnitude of this impact is unknown, however. Habitat zones are reasonably well researched and various areas are covered by MPAs since being designated as priority habitats. It is unlikely that the cumulative impacts of the fishery will lead to permanant irreversible damage to the habitat, and impact is anticipated to be low and reducing as management and compliance improves. An existing MPA network and a fishery that mostly avoids sensitive habitats means that sensitive habitats are decently protected by default and through management measures. Compliance isn't explicitly stated to be a problem as regards habitat degradation, however the full scale of IUU fishing is unknown and therefore it's possible that some habitat impact is unaccounted for. Understanding of how the fishery impacts the primary members of the species assemblage (red and black grouper) and the wider assemblage, other resident species, and habitat, is rudimentry but nonetheless provides a basis from which to develop greater understanding in future, and to implement precautionary management actions now. A new (2017) study has defined the ecosystem components and their relationships to the environment in the Northern Gulf of Mexico (Sagarese et al. 2017) which likely shares similarities to the Southern GoM. Rudimentary information is known about how the wider grouper assemblage interacts with the habitat and resident species, although any definition of a reference state would likely be low resolution and hampered by sparse data. The fishery has overfished red grouper below sustainable levels such that effort is moving onto black grouper. The main two grouper species are known to be highly influential in their local ecosystem such that their depletion will lead to a rebalancing by other species. That said, other species within the assemblage are not believed to be overfished and the current state of red and black grouper is not anticipated to be dire nor irreperable. Ecosystem-centric management objectives are not prioritised however a raft of legislative measures and tightening enforcement introduced in 2013 should address a wide range of problems which impart multiple pressures on the ecosystem, notably reduction of pressure on the two main capture fish species (red and black grouper), closed areas, and generally reduced effort. Scores were determined qualitatively according to available information. (please mouse-over for further details). FIP progress rating remains A with last stage 4 achievement within 12 months. Several activities took place to raise awareness in the community. Cartoons have been used in the program “Fish For The Future” that involves educational workshops with students, and also in awareness events with fishers. Improve in MSC PI score 3.1.2 - stakeholders and authorities are seeking to implement actions to improve surveillance, enforcement, law compliance and establish the path to follow in order to improve grouper fishery sustainability, under the Fisheries and Aquaculture Commission. The “Committee for the Sustainable Management of the Grouper Fishery” was officially created by CONAPESCA. Task 1.6. Encourage the creation of the Committee for the Sustainable Management of the Grouper Fishery, or the FIP’s Sustainability Committee of FIP. Increase in MSC PI .2.1 - Fishery closure from February 1st to March 11th 2016. Publication in the Official Mexican Government Law Journal of the "Management plan of red grouper and associated species in the Yucatan Peninsula"